Q. 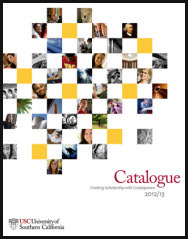 Where can I find USC catalogues? Current and archival issues of the USC Catalogue from 1995 - present are available online. For older issues, email the USC Libraries Special Collections Department at specol@usc.edu. The last five years of the USC Catalogue are also available in print at the Doheny Library Circulation desk (for library use only).